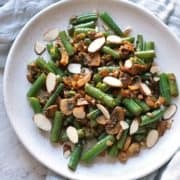 These sautéed green beans and mushrooms are the perfect way to sneak in more veggies to your mornings. Top them with some mashed avocado and some eggs and you’ve got yourself a killer breakfast! I was all about breakfast sides during my Whole30. Like my crispy breakfast potatoes, which got me through the mornings where I just couldn’t face one more egg! But I did face that egg, because I got to enjoy it with some damn potatoes! And these sautéed green beans with mushrooms and onions – they were usually right there beside the potatoes. I remember seeing a photo of beans and mushrooms together somewhere awhile back and thinking DAMN what an unbeatable combination. So I chopped some up, threw them in a pan and covered them in coconut aminos and the rest is history. I make a big batch of these once a week, so I can easily reheat some for breakfast every other day. I don’t know about you guys but I’m all about the easy – especially when it comes to first thing in the morning! And these store well in an airtight container for up to 4 days (pretty sure they won’t last that long). And although I’ve branded these a “breakfast side”, let’s be real – you could eat this at anytime of day. Serve them up with dinner for all I care. You rebel you. Coconut Aminos – OR you can use soy sauce, tamari or balsamic vinegar if you’d prefer. Olive Oil – OR you can use coconut oil or another frying oil if you’d prefer. First, heat oil in a frying pan on medium heat (photos 1-2). Add onion to the pan and cook for 1 minute, stirring regularly. Then add garlic and cook for 30 seconds, continue to stir (photos 3-4). 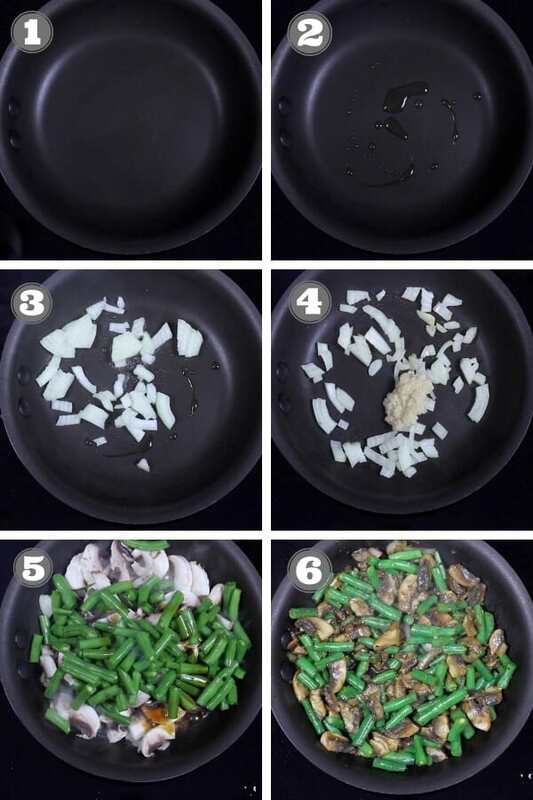 Lastly, add green beans, mushrooms and coconut aminos to the pan and cook until green beans are tender crisp and mushrooms are browned, which will be approximately 3-5 minutes (photos 5-6). Serve as is, or sprinkle some sliced almonds on top for extra crunch. Pop any leftovers in an airtight container and store in the fridge for up to 4 days. Reheat in the microwave or in a skillet. 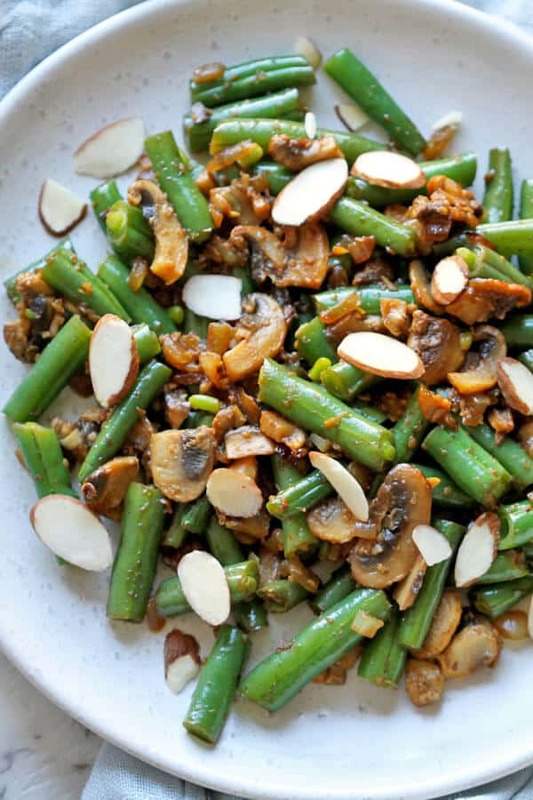 If you’ve tried these Sautéed Green Beans and Mushrooms I’d love to hear how you enjoyed them! Pop a comment and a star rating below! 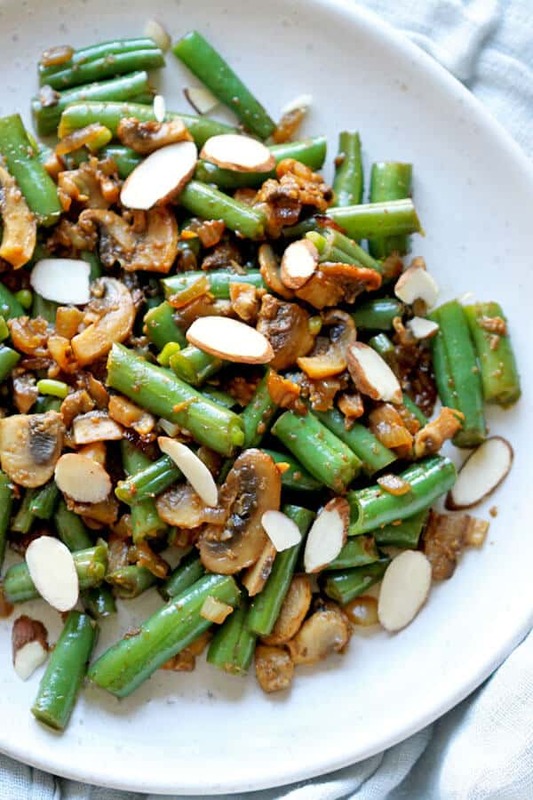 These sautéed green beans and mushrooms are the perfect way to get sneak some veggies into your breakfast! Add onion to the pan and cook for 1 minute, stirring regularly. Then add garlic and cook for 30 seconds, continue to stir. Add green beans, mushrooms and coconut aminos to the pan and cook until green beans are tender crisp and mushrooms are browned, approx. 3-5 minutes. Serve as is or top with slice almonds for added crunch. Coconut Aminos - You can use soy sauce, tamari or balsamic vinegar if you'd prefer. Olive Oil - You can use coconut oil or another frying oil if you'd prefer. STORING - Pop leftovers in an airtight container in the fridge for up to 4 days. Reheat in the microwave or in a skillet. UPDATED - First Published on March 12, 2018. Updated March 22, 2019 - no changes to the recipe, just updated photos and tips. Leon I feel your pain – I struggled with breakfast the most of the whole30! Hang in there – it’s a long slog but it’s worth it!